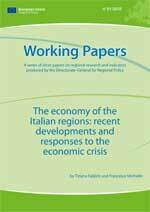 After a seven-year cycle of moderate growth, the international crisis which originated in the United States of America (US) in 2008 has pushed Italy into its deepest recession for 50 years. Italy was the first euro-zone country to record negative growth as early as 2008. A downturn is also expected for 2009, when GDP is forecast to contract by around 5%. income support, the acceleration of public investments and further initiatives to sustain employment and revive business investments – set aside gross resources of around EUR 35.5 billion for the 2008-2011 period or 2.3% of 2008 GDP. Directorate-General Economic and Financial Affairs (DG ECFIN) estimated in a recent Occasional Paper that the overall discretionary stimulus to support the real economy, aggregated over 2009-2010, amounted to around 1.2% of 2009 GDP.